The Dahle 40406 Office Level P-2 Strip Cut Paper Shredder is the perfect mid-size shredder for a busy work environment. The easy-to-use command dial controls all of the shredder's functions including power up, reverse, and continuous run operation. The Dahle 40406 strip cut shredder will shred up to 34 sheets at once into 1/4" strips, and can also handle staples, paperclips, credit cards, and CDs/DVDs. Plus it offers a 10 1/4" feed opening, 30 gal. waste bin, sound deafening wooden cabinet, and lockable swivel casters. Each Dahle Office Shredder features solid cutting cylinders milled from a block of German steel. They're perfectly aligned in an all-steel frame and guaranteed for life. The result is a machine with strength, power and the ability to handle all of your data destruction needs. Designed to shred between 100 and 400 sheets per day. The 40406 offers quick and easy destruction of confidential materials. Transcript: This is the Dahle Level P-2 40406 Office Shredder! Turning it on puts it in standby mode to automatically start and stop shredding up to an impressive 30 pages. The opening is 10 1/4 inches wide, which easily fits the smaller width of a standard page. This is the Dahle Level P-2 40406 Office Shredder! The 40406 can shred up to 34 sheets at a time, which is truly a phenomenal amount. All together, you should be able to destroy as many as 400 sheets per day with this machine. The motor is thermally protected so you don't need to worry about it overheating. This shredder has a 10.25-inch feed opening so you can shred both large and small documents without any problems. The machine's cutters are durable enough to destroy some multimedia items like CD's and DVD's. You will also be able to shred credit/debit cards and documents that have staples and/or paper clips attached to them. The 40406 has a SmartPower system that helps reduce power consumption in between shredding jobs. This feature not only helps you save power (and possibly a few bucks on your electric bill), it helps reduce wear and tear on the machine's motor. This shredder has a 30-gallon waste bin, so it's perfect for sharing with a few of your co-workers. You can use gusseted shred bags to slightly increase the bin's capacity. Also, the bags make it easier to dispose of your shreds. Using this machine is easy since the controls are right on top. You can pretty much just turn the shredder on and get going. The 40406 has rubber shock mounts and a wooden cabinet. These features help muffle sound so you can shred your documents without annoying your co-workers. Finally, this shredder's cutting cylinders are made out of solid German steel. They're backed by a lifetime warranty. The machine as a whole is covered for 2 years. Since this is a strip-cut machine, it only offers level 2 security. This is a decent amount for the shredding of everyday documents but you should keep a cross- or micro-cut machine on-hand for more confidential documents. Overall, the Dahle 40406 is a terrific shredder for people who need a strip-cut shredder for office use. This machine offers an excellent shredding capacity, the ability to destroy stapled documents and some multimedia items, and it has a 30-gallon waste bin. The 40406 is nice and durable, plus it comes with excellent warranty coverage. The one major downside to using this device is that it doesn't offer a very high security rating. However, it's still suitable for everyday shredding. 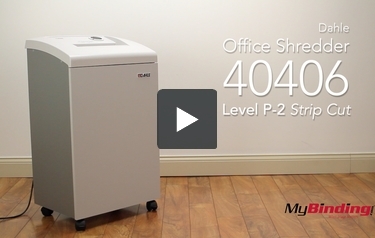 Check out the 40406 if it sounds like the right shredder for your office.